So recently, in preparing for one of my comprehensive exams in early American literature, I scanned in the last eleven years worth of exams into PDF format to make it easier to take notes, copy and paste book titles, authors, etc. Unfortunately, the state of the copies in our department folders meant that I had to first make clean photocopies in order to be able to scan them using our Digital Humanities department’s Fujitsu Snapscan (the side effect of which is a serious case of scanner envy). It wasn’t until I was looking through the newly created PDF that I found a few missing pages, page sequence issues, as well as page direction problems. But using Acrobat Pro’s tools, cleanup of this sort was easy. I also used Acrobat’s OCR tool on the file so that I could copy and paste the text into Word and Excel. I had used Word as my first step so that I could clean up the text (lots of minor OCR misreads) before copying and pasting into Excel (I’m using different worksheets based on the different sections of the exams; though the format has evolved a little over the last decade, they basically fall into IDs, shorter essays, and longer essay sections). And since I was already cleaning up the text within Word, I decided to also keep the Word document just to have a cleaner version of the exams. In cleaning up my Word file, I made sure to try to maintain all the original significant formatting such as italics for book titles; it just makes the exams easier to read. Eventually, I’ll add columns such as themes, persons of interests, periods, related critics, related novels, etc. After getting this far, it occurred to me this task might be easier and more valuable in the long run for gathering different sets of stats, if I were able to insert markup tags. 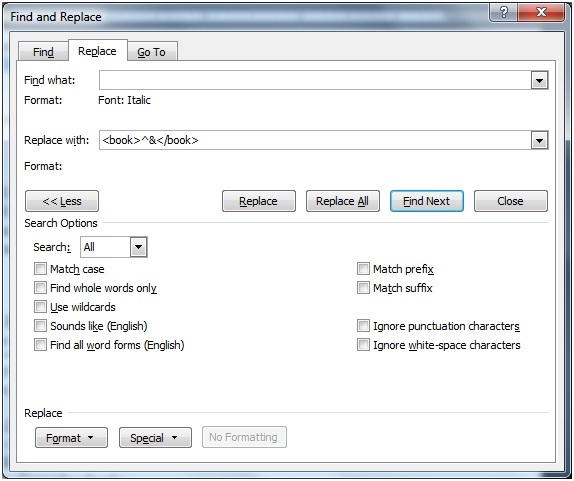 For instance, I know Word will let me search and replace based on text formatting, and so I might be able to search and replace all the italicized words with their original words but also with opening and closing tags (something like <book>…</book>). I couldn’t figure out how to do the replace part until I googled around for Word and using regular expressions. Sure enough it handles them (read a good introduction on this by Microsoft: “Putting regular expressions to work in Word”. However, in the end, I didn’t need to use them. I spent a great deal of time yesterday trying to get past the problem of being able to only replace every italicized word rather than the entire phrase. I eventually got it working using a VBA macro. But it turns out I didn’t need to use the regular expressions or my VBA code. Today, while retyping all of this (I lost my file while running test code—the lesson being, save all open files before testing out your VBA code! ), I found exactly what I needed here. I just swapped out their replacement text with what I was looking for and it worked like a charm. The “^&” below is the code for what I originally was finding (think of it like a variable that contains the original text). By using it in the replace box, I’m able to insert what I needed to as well as the original search terms (in this case, the formatted phrase). One thing to note, though, was that before I did this, I first had to do a search and replace italicized paragraph mark with a non-formatted paragraph mark because it would create an empty set of tags if the paragraph marker was also formatted as italics. Just remember to do this with the closing tag as well. Though there are other cooler ways of doing this, simple and fast go a long way in my book. Of course, I also had to manually verify that all of these tags actually were for book titles. There were a few cases of quotes or exam instructions that I hadn’t taken out, or cases where the question text was being emphasized. In those cases, I used other tags (such as <emphasis>why</emphasis> or <foreign>fin de siècle</foreign>). I currently have no need of these tags, but since it was easy (and I was verifying the text anyway), I decided to go ahead and use them. Next, I want to use this file in Wordsmith Tools to see if anything interesting or useful pops up and see if I can simply create a list of the books based on the <book> tags. Always wanting to feel more confident about results, I decided to double-check the frequency list I generated the other day using R’s functions with Wordsmith Tools (which is a great tool btw). So recently in my Digital Humanities Seminar class, John Laudun asked us to find different tools to use to output a frequency list from a text that interested us. Instead, I decided to try out my R skills, and dusted off my notes from an R Bootcamp for corpus linguistics I attended last year (this was led by Stefan Th. Gries (author of Quantitative Corpus Linguistics with R: A Practical Introduction) and organized by Stefanie Wulff at the University of North Texas, Denton–a brilliant workshop that anyone interested in corpus linguistics and R should attend). I won’t even try to go into what R is; however, a good introduction to it (besides Gries’ book) is at the R Project. What I’m going to do today is show you what I did to create that frequency list. It’s very simple and may be of use to some of you who are thinking about jumping into R and corpus linguistics. Before I begin, I just want to make it clear that my information on the R commands comes from my notes of the bootcamp with Stefan Gries (I was/am very new to R). You can also find this information within his book. 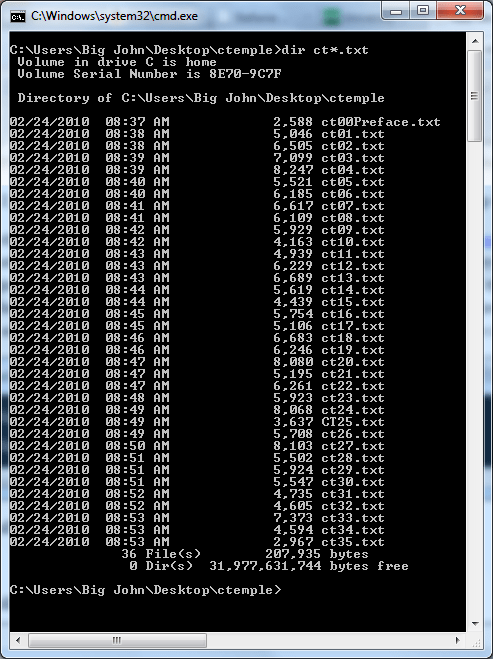 this is followed by what file to type–in this case, it’s all the files that begin with ‘ct’ and end with ‘.txt’ (the asterisk, *, is a wildcard). 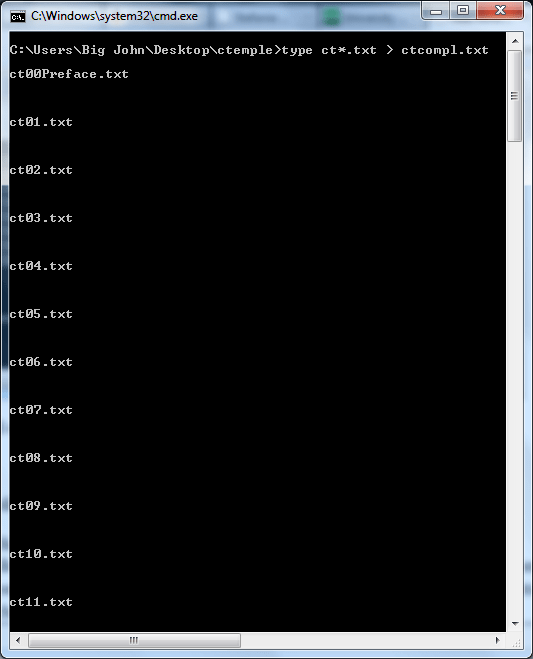 but instead of displaying the contents on the screen, I used a “>” to send the contents to a file. the file name I used for the complete text is ctcompl.txt (if the file doesn’t exist, it will be created; if it exists, then it will be overwritten). A quick command, type ctcompl.txt will allow you to verify the contents of the file. Now one thing I should point out is, that my original naming convention for the separate chapter files is what allowed the text to be built in the correct order. It’s something to keep in mind when building any sets of corpora. Now, if you’re like me, one of the first things I had to get over was what a variable is called in R. It’s called a vector. I’m sure someone (probably Stefan) knows why. But for my peace of mind, I still call it a variable. Declaring or creating a vector is very easy; you just type in the name you want (there are restrictions) then pipe to (send to) it whatever information you want it to contain. choose.files() opens up a browse window to allow you to choose your file (or files–it’s that cool; I really didn’t need to combine all my files after all!). Again, I’m not sure how to do this interactively on the Mac. the what=”char” tells R what kind of data the file contains (allowed types are logical, integer, numeric, complex, character, raw and list). 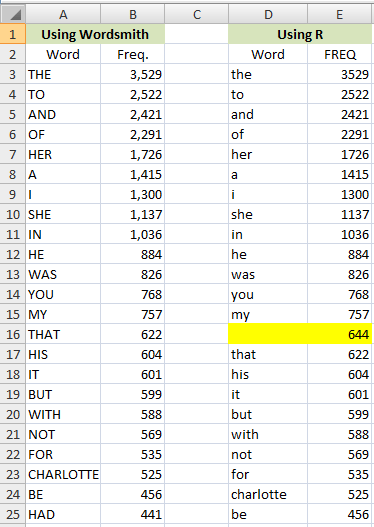 Next we need to break up the data into words. Again, we are doing something to the complete text (temple.text) but instead of overwriting it like we did with the lowercase conversion, we are going to create a new vector in order to keep track of things. strsplit tells are to break up (or split) a string (which is what a bunch of character data is called). the “\\W+” says to split up the data based on whitespace (one way to create words–note though, this will keep punctuation within a word, possibly throwing off your results (“dog.” and “dog” are two different words)–for this post, I’m not going to clean that up, though it can be done). “Take the list, words.list, and turn it into a vector by unlisting it. Though we have a list, another way to store data is within a table (think Excel, columns and rows). R is performs certain kinds of calculations for tables that we don’t get within a list. For a very useful site that explains tables (was well as other things R), go visit the R Tutorial by Clarkson College. and save it to temple.freq.list. This works a lot like what we did with the tolower function in that we saved the new version over the original, but instead we are just sorting it rather than converting its case. This looks a lot like how we would imagine: function words are typically the most frequent. somehow turn the words and frequencies into column looking data. cat() is a way to output a file like type is within the Command Prompt, except that it concatenates its element into a character string before outputting them. In this case, R is beginning the string of data with the string of characters, “Word\tFREQ“–that is, “Word” and “Freq” will be separates by a tab in a text editor; they are the column headers. It should take you to your user folder that corresponds to your login ID (this is slightly different in Windows XP). 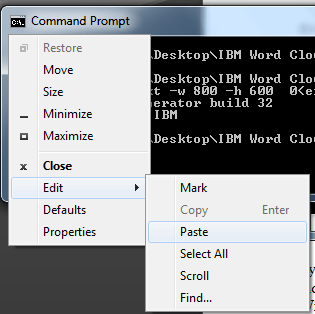 The Windows world uses the backslash key to describe its folder structure. Okay, now you have the Command Prompt window open. Typically, most Terminal windows will start you in your user home directory. My best advice for the sake of this current activity is to use Windows Explorer or the Mac Finder and move the unzipped folder containing the WCG, which is named “IBM Word Cloud” in my case, to the Desktop or to your Documents folder. Some place easy to get to. I was both elated and miffed by an article today on PC World’s site that says of HTC’s new Android tablet, Flyer, that “HTC reaches back to yesteryear by including a pen stylus with the Flyer.” I’m miffed because of the inherent bias that typically comes with the use of a stylus in a computer world (don’t get me wrong; the reviewer loved this function on the Flyer, but the author makes it seem like a retro feature). Finger based computing is great for many things such as navigation, but it is not the end all of inputs. True, I like to type most of my notes, but I also like to be able to scribble them–especially diagrams or directions. I also like annotation. Annotation is the lifeblood of scholars (for professors as well as students). Using a keyboard, mouse, or finger to highlight or insert comments on an ebook, pdf article, or text document just is not as good as being able to use a stylus. The pen is much more precise and quicker. I’ve been waiting a long time for word on inclusion of a stylus with the new phone-centric tablets. After all, that is one of the key features of the more mature laptop-based tablets. I’ve seen a couple of manufacturers include a stylus for selection and even a few for drawing and some handwriting-within-a-window uses (reminds me of Apple’s Newton) but nothing (again, on the phone-based tablets) that lets me use a pen the way I use a pen. So bravo, HTC! I hope other manufacturers follow. It’s not like search engine optimization uses and abuses haven’t been in the news before, but this is a good reminder that our World Net View comes filtered, not at the least by anything we ourselves do, but by the whims of one company. Don’t get me wrong; I like Google and really do believe their shtick about doing no evil (unlike Apple). However, they are a business. And a business’s continued existence relies on earning money. That kind of control makes me nervous. However, what this article did was to highlight a secret even dirtier than the “Black Hat” tactics: search engines require secrets. Right after my initial response to the article (thumping my desk, saying this is a problem in need of an open source solution! ), I realized that an open-sourced search engine, whose search and ranking algorithms were publicly known, would not only be open to abuse out of the gate, but would encourage it. And so the searches would fail. And so must we live with One Engine to seek them all and in the darkness find them, trusting that market competition will keep it from doing evil? Or should this become a government operated function–like a utility or even more so, like the Mint? After all, part of that function is to prevent counterfeiting. But do we really want the”success” and “efficiency” of government control involved? It seems that there would be as much temptation for abuse as there is in the private world. What then? Does anyone know of an open source plan that could prevent search algorithm abuse? after all, dictionaries should be a more communal oriented effort. I still need to search through their forums to see about the maintenance business. Apparently that depends on whether you spoke the word or heard it. Trying out a post from the WordPress app for Android. Seems okay if you need to edit something remotely, but let’s face it: a real keyboard would be nice. But for short items, it works fine. I am now trying out androids dictation application. What do you know? It worked the first time! The menu tagging and other editing features and menu options are pretty slick too. There are also the standard text editor features such as bold and italics.